Price moved lower today with a lower low and lower high, but the session closed strongly printing a green daily candlestick. The balance of volume was upwards. On Balance Volume gives a reasonable signal, but there has not yet been a breakout from a consolidation. Careful analysis of volume, On Balance Volume, and VIX may assist to find an entry to join the current trend. Summary: Price has broken out upwards from a flag pattern. 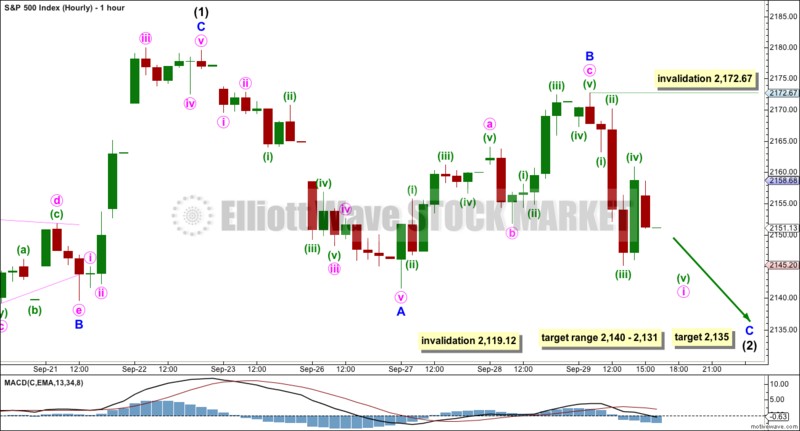 A target using the measured rule is 2,323 and an Elliott wave target is 2,382. Monday, and maybe Tuesday as well, may see price move a little lower; the target is at 2,284. A new low below 2,257.02 would indicate a deeper pullback to the purple trend line. If looking for a point to enter long, always use a stop and do not invest more than 1-5% of equity on any one trade. Volume declined for Friday, On Balance Volume is very close to support, but VIX diverged from price on Friday. The last time VIX did this was during a consolidation which moved price overall lower. That is one reason why I expect some more downwards movement. But look out, the alternate is possible. Cycle wave V is an incomplete structure. 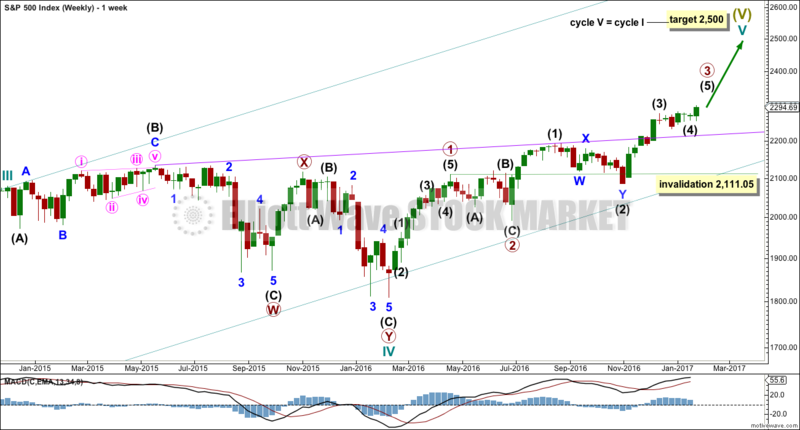 Within cycle wave V, primary wave 3 may be relatively close to completion. When primary wave 3 is complete, then the following correction for primary wave 4 may not move into primary wave 1 price territory below 2,111.05. Primary wave 2 was a flat correction lasting 47 days (not a Fibonacci number). Primary wave 4 may be expected to most likely be a zigzag, but it may also be a triangle if its structure exhibits alternation. If it is a zigzag, it may be more brief than primary wave 2, so a Fibonacci 21 sessions may be the initial expectation. If it is a triangle, then it may be a Fibonacci 34 or 55 sessions. Primary wave 3 at this stage though is incomplete and may continue to move price higher. It is possible that intermediate wave (4) is a complete combination: zigzag – X – flat. It would have been even in duration with intermediate wave (3), both lasting 26 days. Intermediate wave (3) is shorter than intermediate wave (1). 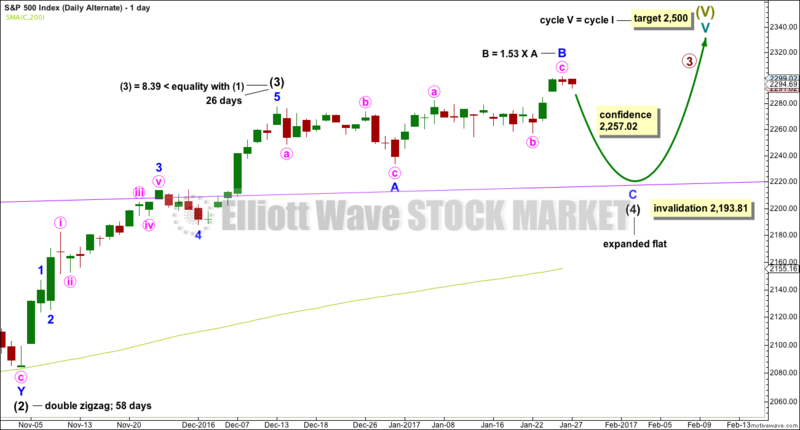 One of the core Elliott wave rules states a third wave may never be the shortest wave, so this limits intermediate wave (5) to no longer than equality in length with intermediate wave (3) at 2,450.76. 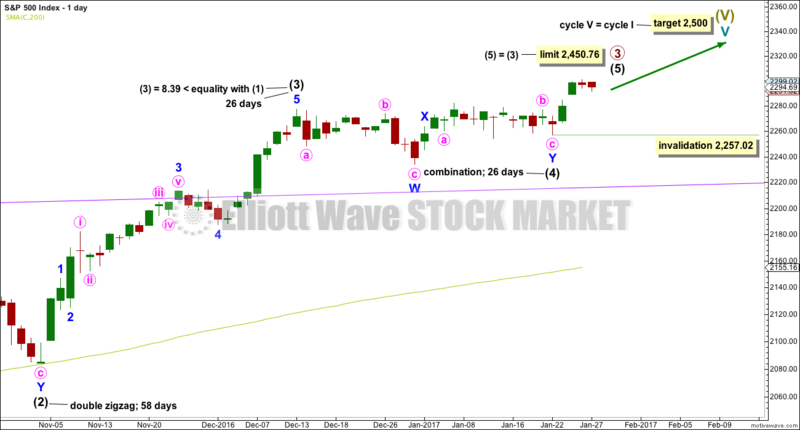 Within intermediate wave (5), no second wave correction may move beyond its start below 2,257.02. Intermediate wave (5) has so far lasted just four days. It may be expected to be shorter both in length and duration compared to intermediate wave (3). At this stage, an expectation of a Fibonacci 13 days total for intermediate wave (5) looks reasonable, so it may now continue for another 9 days or sessions. The proportion here between intermediate waves (2) and (4) is acceptable. There is alternation. Both are labelled W-X-Y, but double zigzags are quite different structures to double combinations. Intermediate wave (5) must subdivide as a five wave structure, either an impulse or an ending diagonal. At this stage, it is not possible to eliminate either option. Within intermediate wave (5), minor wave 1 may be complete. Minor wave 2 may be relatively brief and shallow. This was the pattern within the last upwards wave of intermediate wave (3) (from the 4th November, 2016, to the 13th December, 2016, seen on the daily chart). There, minor wave 2 was just 0.34 of minor wave 1 and was over within one session. Look out for this tendency again. 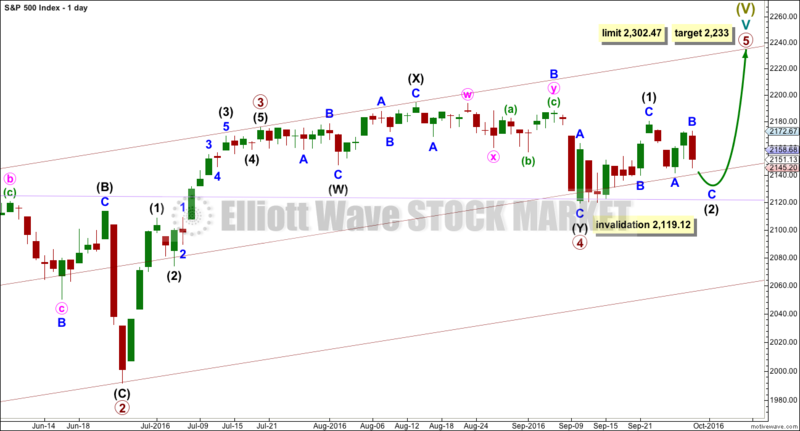 Within intermediate wave (3), the longest duration for a correction was four days for minor wave 4. Within intermediate wave (1), minor wave 2 was brief lasting only two days. It was also shallow at only 0.30 of minor wave 1. This does not mean that minor wave 2 within intermediate wave (5) must also be brief and shallow, only that the balance of probability points to this. The preferred target for minor wave 2 will be about 2,284. Analysis of the structure of minor wave 2 at the five minute chart level shows it is most likely incomplete. Minute wave a subdivides as a leading contracting diagonal and minute wave b subdivides as a three. 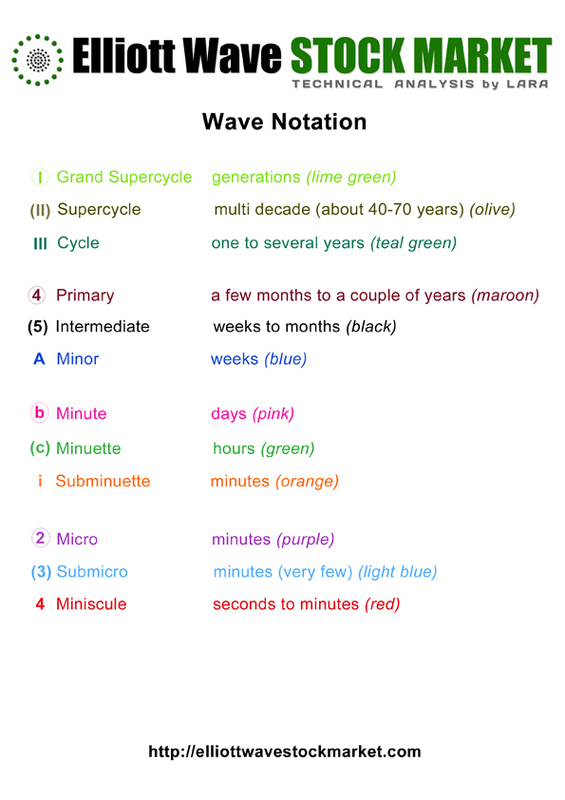 Minute wave c must be a five wave structure. But as of Friday’s low that does not fit, so it looks likely to move lower. If price moves below 2,257.02, this main wave count would be invalidated and the alternate below would be confirmed. This was the main wave count until recently. With classic analysis now very bullish, it is now an alternate as it has less support. It remains possible that intermediate wave (4) is an incomplete expanded flat correction. With On Balance Volume breaking below support on Friday, this alternate wave count has increased in probability. 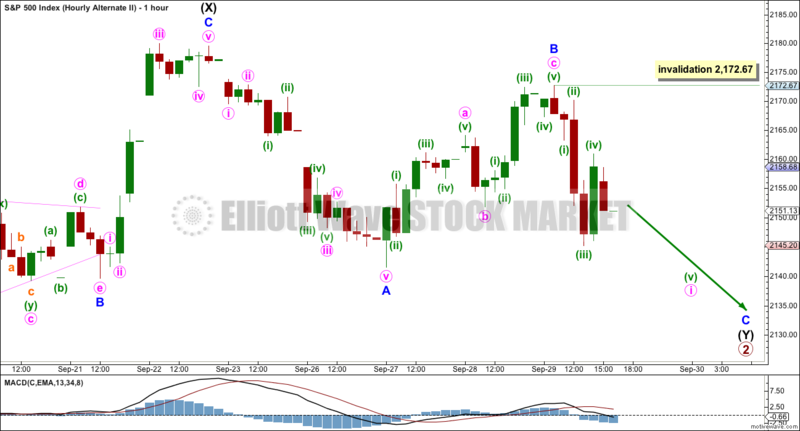 It illustrates the risk to entering long positions based upon the main wave count here. So far intermediate wave (4) may have lasted 30 sessions. It may continue for another four to total a Fibonacci 34 days or sessions. No target is given for minor wave C downwards because a target calculated using the Fibonacci ratio of 1.618 to minor wave A results in price falling short of the purple trend line. Minor wave C may end only when price comes down to touch the trend line again. Minor wave B is now a 1.53 length to minor wave A. This is longer than the normal length of up to 1.38 but within the allowable convention of 2. The length of minor wave B has reduced the probability of this wave count. Intermediate wave (4) may not move into intermediate wave (1) price territory below 2,193.81. It should find very strong support at the purple trend line and stop there. A strong upwards week comes with an increase in volume. The rise in price is supported by volume. On Balance Volume has found support and moved up and away from the long yellow support line. This is a bullish signal. OBV has not yet reached resistance. It may find some resistance at the purple line. 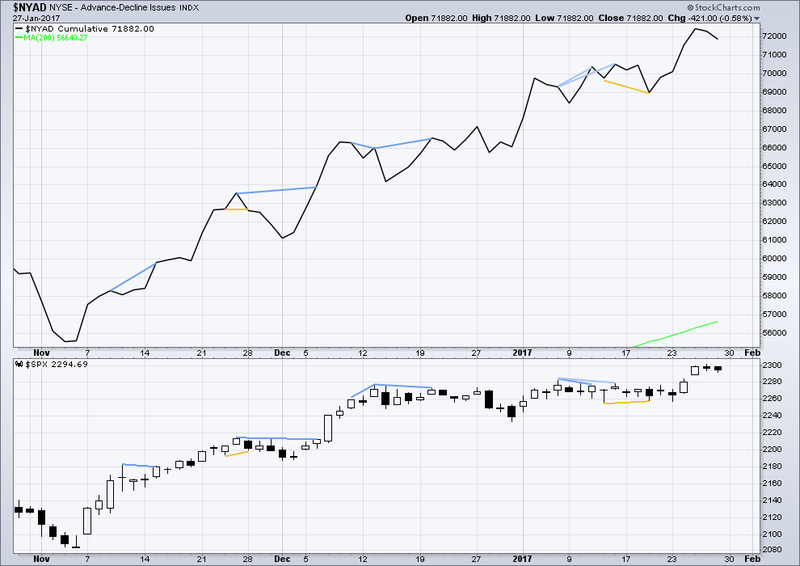 RSI is not yet overbought and exhibits no divergence with price. There is room still for price to rise further. ADX indicates the beginning of an upwards trend. This is not extreme. There is plenty of room for the trend to continue. A bull flag pattern has completed and an upwards breakout closed above prior resistance. The flag pole is short, only 48.48 points, so a target using the measured rule would be about 2,323. A downwards day for Friday comes with a decline in volume. The fall in price is not supported by volume. Volume suggests that downwards movement may end here or very soon short term. The breakaway gap may now offer support. If any members hold long positions, this may be used to pull up stops. Or if entering a long position, the lower edge of the gap may provide a good point for a stop. Price found resistance about the round number pivot at 2,300. ADX today is increasing from yesterday and it is above 15. An upwards trend is indicated, which is not extreme, so there is room for this trend to continue for a reasonable distance. ATR is now overall flat with a small range day today. ATR increased while price moved higher, so there is still some strength within this trend. On Balance Volume gave a strong bullish signal with a break above the purple trend line. 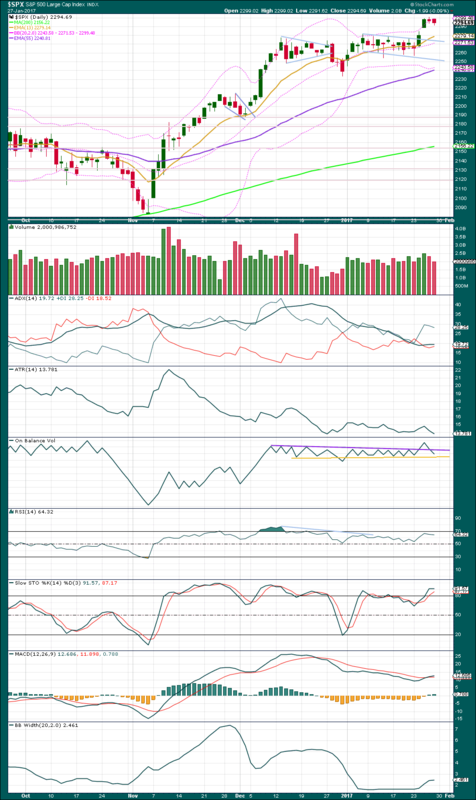 Now OBV has moved below the purple trend line, negating the strong bullish signal. The yellow line is close by and may offer some support. This may assist to halt the fall in price. If price moves lower early next week, it may not be by much. 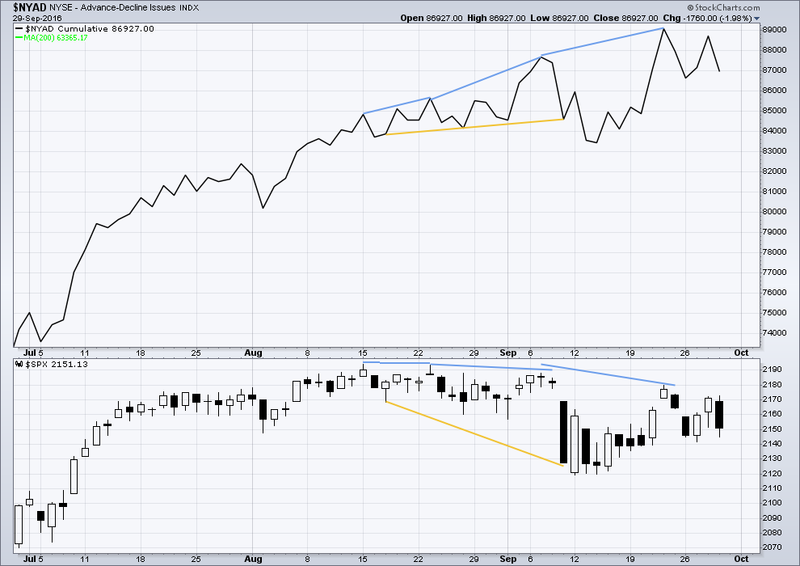 There is still strong and long held divergence between price and RSI. 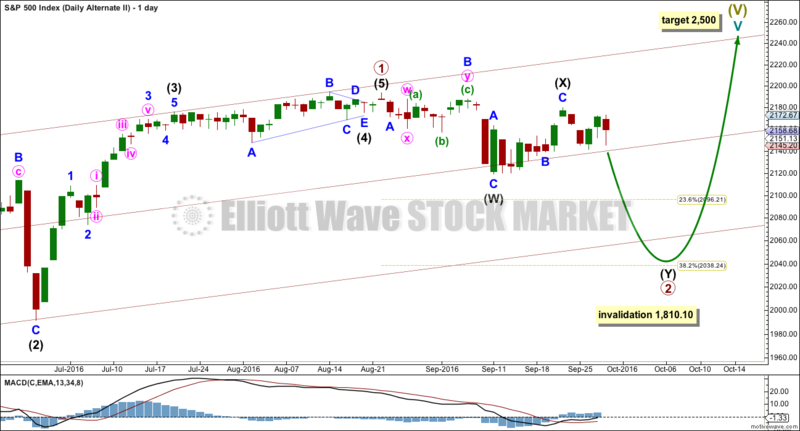 This may disappear, but it does offer some support to the Elliott wave count which sees this upwards wave as a fifth wave. Fifth waves very commonly exhibit divergence as they end. 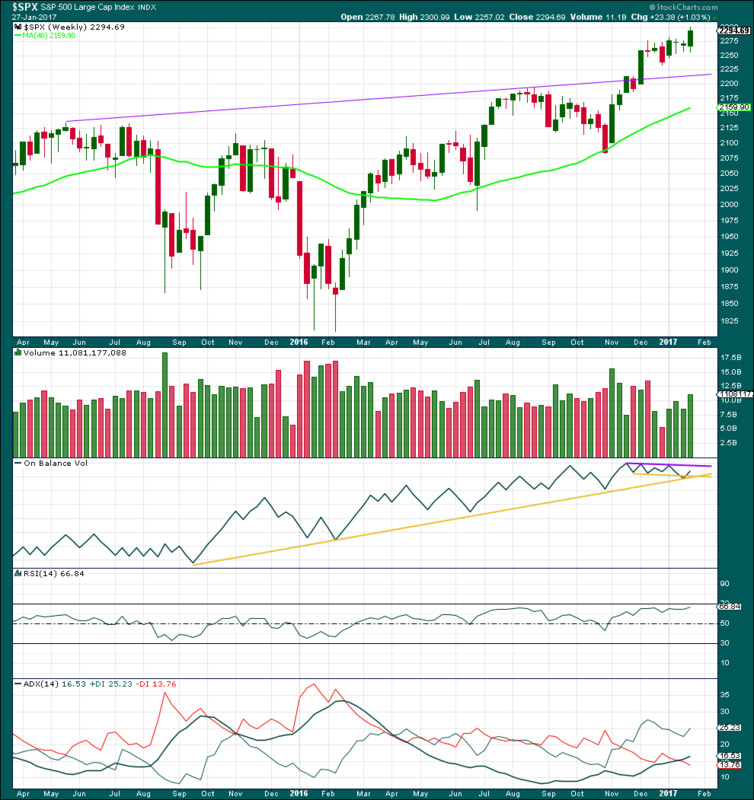 RSI is not yet overbought, so there is room still for price to rise further. 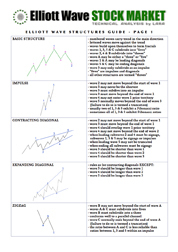 There is strong and long held divergence between price and Stochastics. This may persist for reasonable periods of time during a trending market. MACD shows a bullish crossover. 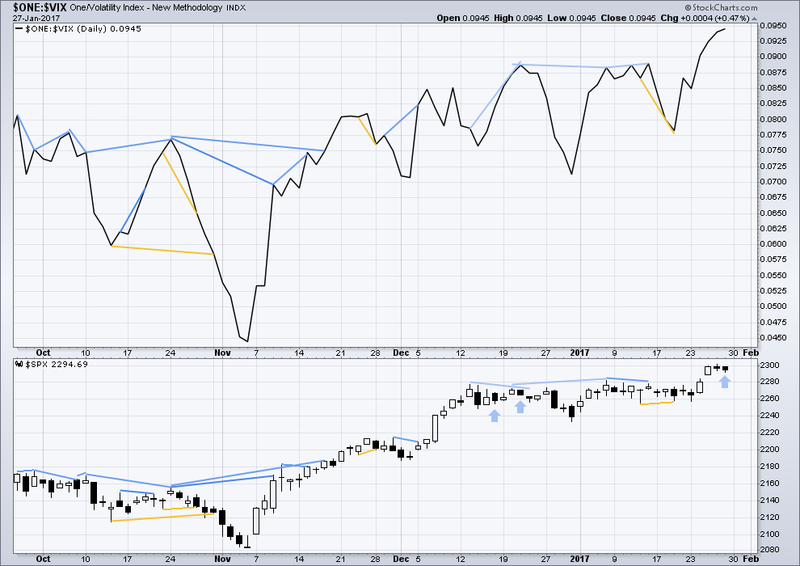 Bollinger Bands continue to expand. Volatility may be returning to the market after the breakout. There is plenty of room for volatility to increase further. Price closed close to the upper edge of Bollinger Bands today, but this does not necessarily mean that price must move lower tomorrow. The last upwards trend saw price close above the upper range of Bollinger Bands for three days in a row, but the end of that trend was still not seen for a following three days. Price can sit at the extreme of Bollinger Bands for several days when a trend is strong. There are a few instances of multi day divergence between price and inverted VIX noted here. Bearish divergence is blue. 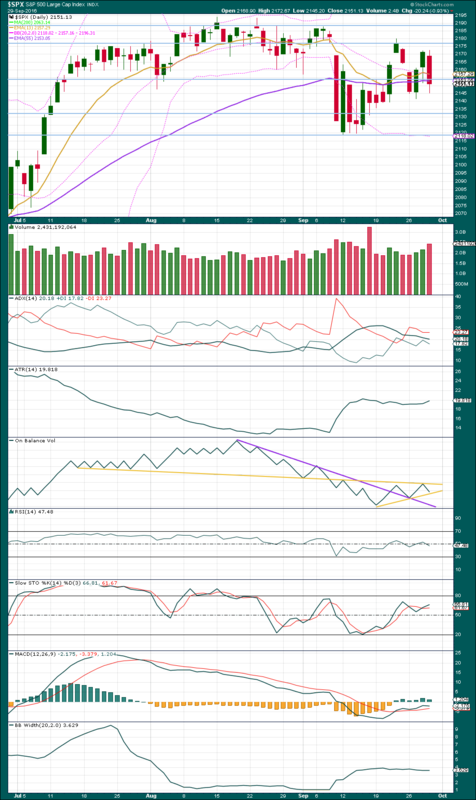 Bullish divergence is yellow. It appears so far that divergence between inverted VIX and price is mostly working to indicate short term movements spanning one or two days. While this seems to be working more often than not, it is not always working. As with everything in technical analysis, there is nothing that is certain. This is an exercise in probability. Price moved lower during Friday’s session and the balance of volume during the session was down. Normally, inverted VIX would also move lower indicating an increase in volatility as price declines. However, inverted VIX moved higher on Friday indicating a decline in volatility. The fall in price is not accompanied by a corresponding decline in volatility. This is abnormal. The last two times this occurred are noted with blue arrows. It is noted that on those occasions divergence was followed overall by a further decline in price. Not immediately, but this was during a consolidation that ended lower. That may happen again here. Normally, I would interpret this divergence as bullish, but it may actually be bearish considering recent behaviour. 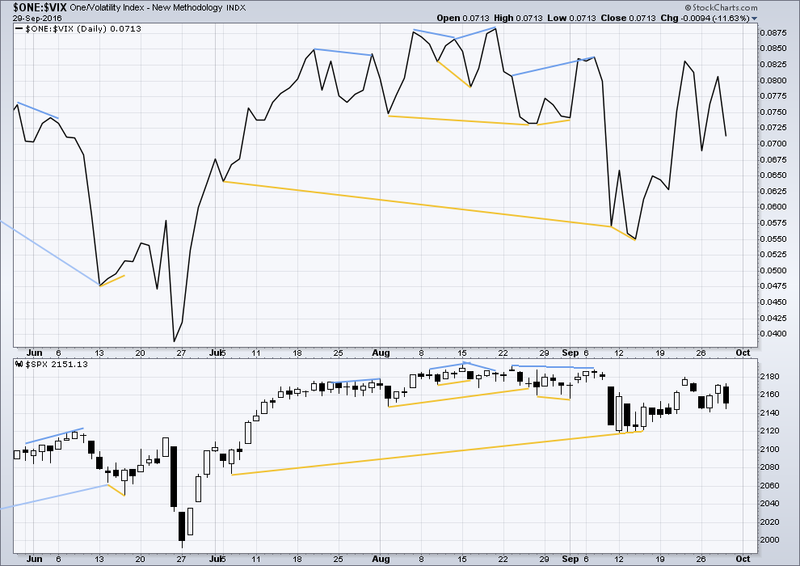 No new divergence at today’s new high is noted between price and the AD line. The AD line moved lower for Friday. The fall in price was accompanied by a normal decline in market breadth. The DJIA, DJT, S&P500 and Nasdaq have made new all time highs in December of 2016. This confirms a bull market continues. This analysis is published @ 12:19 a.m. EST on 28th January, 2016. 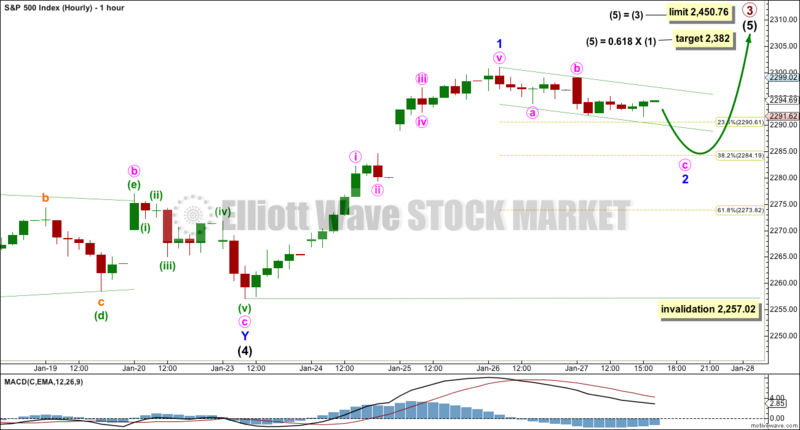 A little upwards movement invalidated the hourly Elliott wave count. A small inside day continues a small consolidation, which was what both the daily and two hourly Elliott wave counts expected. The alternate hourly Elliott wave count will be discarded today. 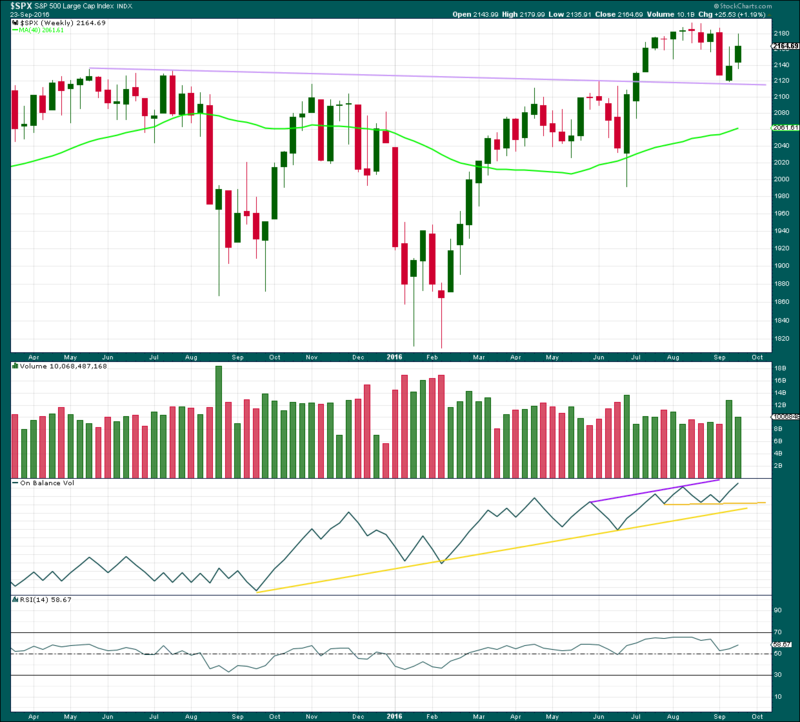 Yesterday’s analysis expected to see a green daily candlestick or doji for Thursday’s session. This is not what happened, price has continued lower. Yesterday’s analysis was indecisive. The preferred Elliott wave count required downwards movement, but volume suggested this might not happen. Price did move lower. 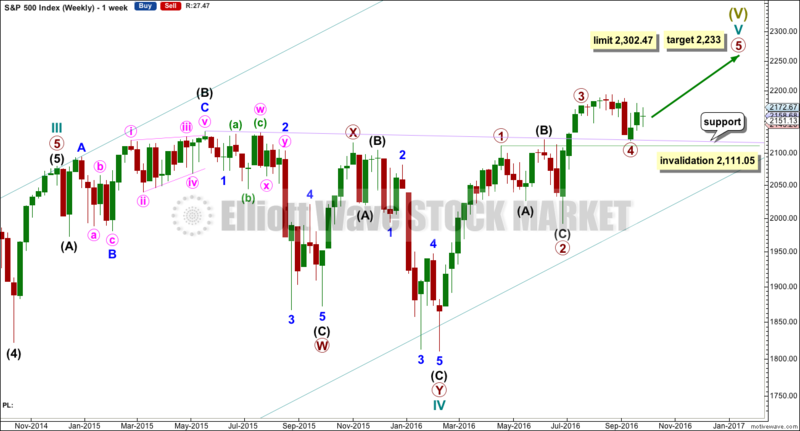 The preferred Elliott wave count now looks right and on track. Summary: Tomorrow should see another red daily candlestick or doji towards the target at 2,135. This target may be reached in one to three days time. Intermediate wave (2) may be just over half way through and has so far lasted five days. It may continue for another three if it is even in duration with intermediate wave (1) and exhibits a Fibonacci number of eight days. It does not have to take this long and may end more quickly now. Intermediate wave (2) should be expected to be a big obvious three wave structure. So far minor wave B shows at the daily chart level as two green daily candlesticks. Minor wave C downwards now looks like it has begun with one strong red daily candlestick. At 2,135 minor wave C would reach equality in length with minor wave A. This target is within the range of 2,140 – 2,131. So far, within minor wave C, minute wave i may be coming to an end. This degree of labelling is chosen because it would allow minor wave C to continue for three more sessions. When minute wave i is a complete five wave impulse downwards, then minute wave ii upwards should unfold and may not move beyond the start of minute wave i above 2,172.67. A strong downwards day with an increase in volume is bearish today. The fall in price had support from volume for Thursday’s session, so more downwards movement for Friday at least would be a reasonable expectation. The next line of support for price is about 2,134, the prior all time high. 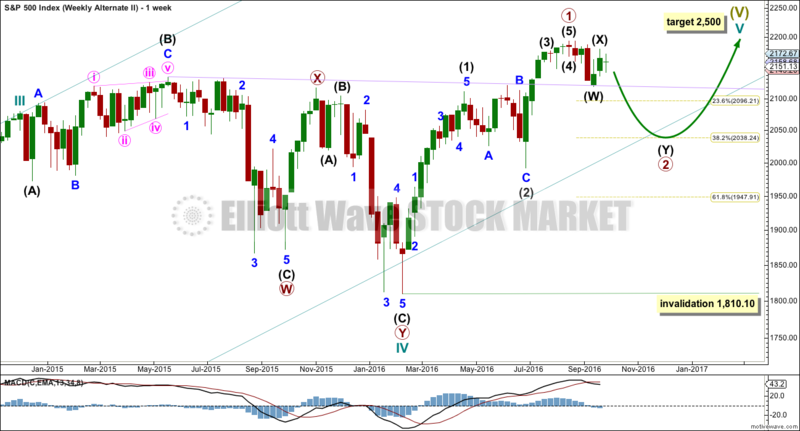 This fits neatly with the target for the Elliott wave count. Following that, final support is at 2,120. ADX is declining, indicating the market is not trending. ATR is overall flat, in agreement with ADX. Bollinger Bands are now very slightly contracting. This market is not trending. This market is consolidating. Within this long consolidation, which began back on about 11th of July, it is three downwards days that have strongest volume. This suggests a downwards breakout is more likely than upwards. This trick may or may not work for the S&P at this time. It is one piece of evidence to weigh up. This consolidation is bounded by resistance at 2,190 and support at 2,120. On Balance Volume has turned down from the long horizontal yellow resistance line. The strength of this line is reinforced. A new short support line is added today, in yellow, and this may provide a little support here. A break below the new yellow line would be a small bearish indicator. But this line is too short, sloped, and has only been tested once, so it does not have good technical significance. The purple line, which does have reasonable technical significance, should provide final support for OBV. This analysis is published @ 09:13 p.m. EST. The short term expectation for Monday was for a little downwards movement to a target at 2,122 before a turn and upwards movement. The low for Monday was 2,119.12, 2.88 points below the target. A short sharp thrust down was expected before price turned upwards, but this is not what happened. Price moved upwards at the start of the session. Price moved sideways to print a small green doji daily candlestick. Upwards movement is choppy and overlapping indicating a diagonal.